"Its sweetness was born of the walk under the stars, the song of the pulley, the effort of my arms. It was good for the heart, like a present." This quote from The Little Prince described the taste of water from a well, after a long, thirsty walk in the desert. To me, Saint Exup�ry's words also capture why hikers are so willing to give up all the comforts of the civilized world to venture out into the wilderness with only a backpack of meager belongings. 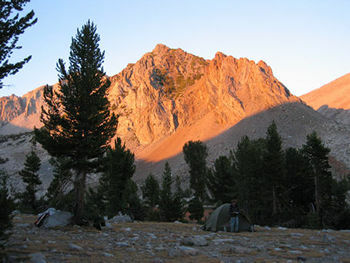 Backcountry hiking is the best way to appreciate the natural world in all its glory, and we in California are blessed to have the spectacular Sierras in our own backyard. The sweetness of the Alpenglow at the end of each day is enhanced by the day's work to get there, and it makes the heart glad just to have experienced it. Throw in some dry fly action with eager golden trout and you have my personal vision of heaven. Oh, and did I mention the hot springs? Pat and Mike McGuire have generously lead the Fish Creek fishout for the last 4 or 5 years, and they have honed the route so that even casual backpackers like myself can enjoy the trip. This year's route followed the same course as last year with some small adjustments in campsite location, mainly to more evenly divide the hiking. 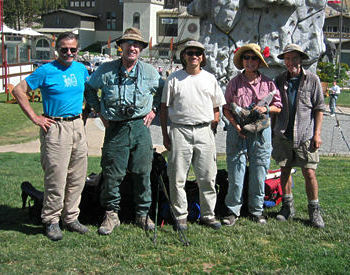 The members of the "Fellowship" this year included Pat, Mike, John Files, Jim Gordon, and myself. Jim was Mike's graduate school classmate and he made the long drive from Seattle to participate in this year's hike. The trip started from the Lake Mary campground near Mammoth Lakes. The day before, John Files and I had driven over from the Bay Area and did an acclimation hike at Gardinsky Lake, near Tioga Pass at 9,900 feet. 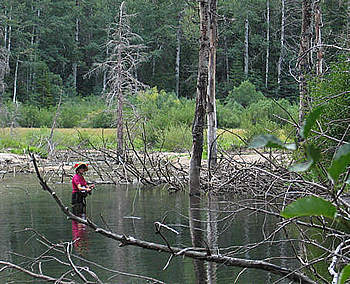 Of course, we also had some good tips that Gardinsky would be a productive place for brook trout. Imagine our surprise while we were casting our flies into the lake when Mike and Pat appeared on the opposite side of the lake! Evidently, they were also looking for a short, high altitude hike and so we all converged at Gardinsky. The brook trout, however, were scarce. Both John and I caught one each, but that was the extent of the action. 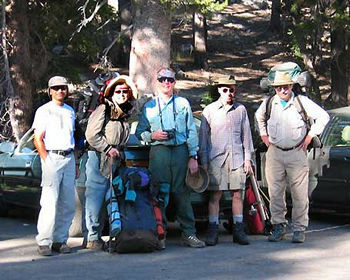 We all trooped back down the hill for the drive back to Mammoth where we stayed Saturday night. We set out on Sunday morning around 9:00 AM with some trepidation since the toughest climb of the trip was just before us. From Lake Mary the trail climbs to Duck Pass at 10,300 feet, roughly a 1,700 foot elevation change over 3 miles. Along the way we passed several small lakes (Skelton, Red, and Barney) before starting the hump up to the pass. Having done this the year before, I stuck my head down, sucked a lot of water through my Camelback, and slogged my way up the grade. I vowed not to take a break until I reached the top. Along the way we met two groups coming down. The first was abandoning their hike because of a boot failure, and the second was heading down because of altitude sickness. Little did we know, but both of these were bad omens of things to come. We made the pass in about 3 hours and were rewarded with a spectacular view of Duck Lake nestled in an enormous granite bowl on the other side of the pass. Our campsite for the evening was a saddle between Duck and Pika Lakes. Although tired from the climb, after establishing camp, everyone assembled their rods and wandered to the water to see if there were any fish in Pika Lake. The fishing turned out to be slow, although John and I nailed a few rainbows. The foam hoppers I tied for the last fly swap seemed to do the trick. Mike caught a handful of rainbows in Duck Lake too. To save weight, Mike and I had brought hippers instead of chest waders. After releasing my second rainbow, I saw a fish rising just out of casting range. Naturally, I stepped towards the fish with the full expectation that, well, I could continue on out as usual up to my chest. Nature has a way of imposing hard physical rules, and my hippers soon became buckets. Although I trudged back to camp to dry everything out, the 2-way radio I had in my pocket never really worked quite right for the rest of the trip. 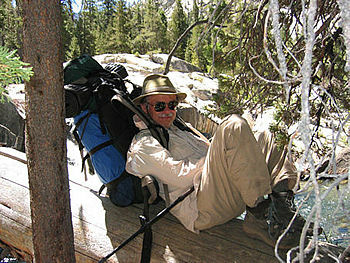 Back at camp, I found that Jim was sleeping off altitude sickness. Luckily, he seemed to recover after a good night's sleep. Although the longest single climb was behind us, Monday featured three small grades, the last of which was about 500 feet. While that may not seem like much, keep in mind that you are carrying 40 lbs of gear and you're breathing thin air. We reached Purple Lake by lunchtime and Mike, Jim, and John all tried their luck. Last year we camped at Purple Lake and the evening rise was magic. However, this time in the middle of the day, the trout seemed decidedly closed-mouthed. Jim caught the only fish, which he landed because he snagged another line attached to a huge hook embedded in the trout's gullet. Pat, on the other hand, was repairing her hiking boot, which had decided to start "deconstructing." Luckily we had ample supplies of duct tape, which held things together for the rest of the trip. After lunch we continued to our evening's camp on the banks of Lake Virginia. The California State record for golden trout came from this lake, albeit in 1952. Again after setting up camp, everyone headed out to try their luck with nearly uniform results - a slow pick of small rainbows. However, I saw several enormous rises beyond casting range, so there may still be some records out there. After the slow action on the lakes, we were all eager to continue on to Fish Creek, a short 3-mile downhill hike from Lake Virginia. Up to this point, we had been hiking roughly parallel (and upstream) to Fish Creek, which runs down the scenic Cascade Valley. Our trail finally dropped down into the valley through a vast bowl called Tully Hole. This is one of the most spectacular panoramas of the trip as the trail drops 1,500 feet through a countless series of switchbacks. At the bottom of the hole, Fish Creek meanders through a lush meadow. Like the tantalizing Sirens who lured ancient Greek sailors, this section demands that all fishers halt and assemble their rods. Who were we to think otherwise? So we dropped the packs and declared a long lunch stop. Jim and John fished the meadow, Mike and I worked downstream, and Pat worked the stretch closest to our break point. 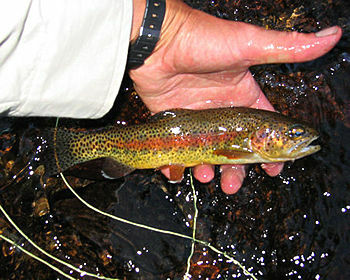 Everyone caught fish, nearly at will, and Jim and John reported schools of spooky brook trout darting around the meadow. I had fun fishing a parachute ant I had tied, and it accounted for my first golden of the trip. It sipped the fly so gingerly off the surface of the creek, I blinked before setting the hook since I wasn't sure what had happened to the ant. After lunch, we continued downstream along the creek, our geological guide for the next 3 days. Because this stretch of the trail is also the Pacific Crest Trail/John Muir Trail, we saw many hiking groups, including one that was using llamas as pack animals. We took a short break at the base of a spectacular waterfall, which allowed me to try my new toy. I was toting a collapsible fly rod (review to come in October), which I kept strung and strapped to the outside of my pack. In a flash, I had it extended and had two fish in three casts on an E/C Caddis. Jim actually thought I was the world's fastest rod stringer until Mike told him my secret. Later after dinner, I returned to this pool and caught 23 brook and golden trout in 45 minutes. Camp that night was at First Crossing, so named because hikers must ford the stream to follow the trail. As usual, the fishing was spectacular, with Mike keeping four fish for dinner. 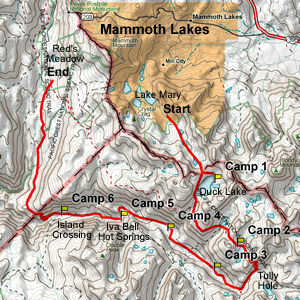 Day 4 – Where to Camp? The balance of hiking and fishing for the next three days swung decidedly towards fishing. Each day we would hike 3 or 4 miles downstream, set up camp, and hunt for fish. From First Crossing, we moved downstream to a spectacular stretch of river that featured a series of 4 or 5 huge waterfalls, each one unique. Our only difficulty was finding an adequate place to camp. After a lengthy but unproductive search, John and Mike both had the brilliant idea to look on the other side of the river where we ultimately discovered a nice flat spot. After pitching the tents, we all headed to the river to test the waters. Fish Creek at this point is so productive that we were all catching 30 or 40 fish each, mainly a mixture of brookies, goldens, and golden/rainbow hybrids. Because of the harsh environment, these are all small fish, with a 10 or 12-inch trout considered large. Once again, Mike and Pat had the hot rods, and they kept 4 nice fish for dinner. Our path to the Iva Bell hot springs crossed the creek again at Second Crossing and then detoured away from the river by climbing up and over a ridge on river left (facing downstream). The creek itself continues straight, descending precipitously through a forbidding canyon. The cascades and pools at this point were so enticing that I couldn't help but drop my pack and give the telescoping rod a whirl. I was rewarded with a chunky little golden that attacked my parachute hopper well after the fly had sunk beneath the swirling foam. I paid for my few minutes of pleasure by having to walk extra-fast to catch up to the rest of the group who were well on their way over the ridge to the hot springs. One of the things you learn by hiking is that you can get by without a daily shower. On the other hand, five days of sweat, suntan lotion, and bug spray can get a little aromatic. And unfortunately, the smell only seems to encourage the bugs. It goes without saying that the pools at the hot springs are a welcome sight. On the other hand, it is easily within a day's walk of the nearest trailhead at the Devil's Postpile National Monument, our ultimate destination, so one rarely finds solitude here. We arrived just before noon and were able to stake our claim on one of the nicer campsites. Leaving the hot springs, we quickly covered the 2.5-mile descent to our final camp at Island Crossing. On the way, Mike walked right past a black bear that was crossing the path from the river. Jim was behind and started shouting at the bear who nonchalantly ambled away. He probably left with the impression that humans are easily excitable creatures. Unfortunately, I was lagging behind because my feet hurt from my ill-fitting sandals that I'd been wearing over my stocking foot hipppers. So I missed all the "fun." At Island Crossing the tents went up quickly and everyone was on the water in a twinkle. Jim, John, and Mike went downstream while Pat waded upstream. I sat for a while in camp nursing my sore feet. A while later Mike came back shaking with fury. He had been trying to take a picture of a fish with his digital camera when the camera decided that it was no longer taking pictures that day. Mike would have dashed the recalcitrant object on a big rock had it not been for my plea for clemency. On the other hand, Mike probably would have called it a mercy killing. 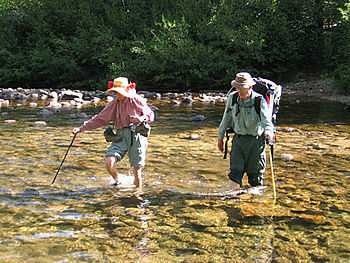 At Island Crossing the creek meanders through a wonderful meadow filled with brook trout. We were starting to take it for granted that we could throw almost anything in the water and elicit strikes. While most of the fish fell in the 6 to 8 inch range, every now and then a big one would slash at the fly for a pleasant surprise. John had the big fish of the day which we ate with two of my keepers for dinner. John amazed me with the variety of spices he was carrying in his bear barrel. We got an early start on our final day because of the 8-mile and 1,300-foot climb out of Fish Creek. The day began with an immediate 600-foot climb over a series of 16 switchbacks which is best done in the morning. This climb is physically hard and always a bit melancholy because it means the fishing is done and the trip is almost over – like the way a child feels at the end of summer vacation. 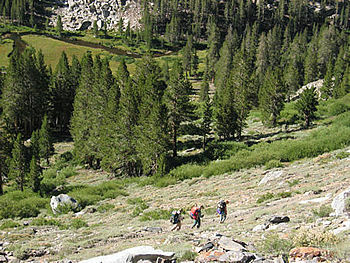 We climbed a ridge over to the next drainage, the scenic valley created by the middle fork of the San Joaquin River. We followed this valley through dry and dusty conditions to Rainbow Falls and the Devil's Postpile National Monument where we caught the shuttle bus to the Mammoth Ski area and our shuttle car. This area suffered from a major forest fire in 1992 and it is fascinating to see how the forest is rejuvenating itself. 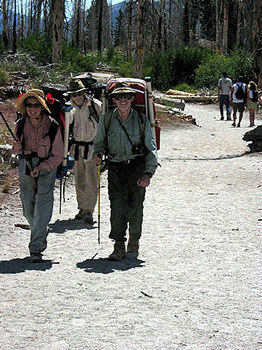 However, for hikers, the lack of forest cover makes it a hot, sunny trek. A big thanks (again) to Pat and Mike for putting together another "once-in-a-lifetime" trip!